Meet Michael Consuelos - Kelly Ripa and Mark Consuelos’ Son, Is He Gay? Meet Michael Consuelos – Kelly Ripa and Mark Consuelos’ Son, Is He Gay? Audiences melted with hearty “awws” as Kelly Ripa‘s teenage son, Michael Consuelos, stood up with the rest of the family as his mother received her star on the “Hollywood Walk of Fame.” With Mommy and Daddy in the entertainment industry, Michael’s flair for acting is yet another proof that apples don’t fall far from the tree. Since he debuted in 2012, the young chap has appeared on TV series like Duck Dodgers, Go, Diego! Go! and of course, Riverdale. He is well on his way to becoming a Hollywood star like his parents. But even at such an early stage, there are controversies trailing his persona, career, and life. With his parents’ voices loudly behind the LGBT community, there are speculations that Michael may be gay after all. We bring you details about Michael Consuelos’ life, fledgling career, net worth, relationship status, and body measurements…enjoy! Michael Consuelos was born on June 2, 1997, to Hollywood couples Mark Consuelos and Kelly Ripa. As the oldest of three children, Michael and his two siblings, Lola Grace (b. 2001) and Joaquin (b. 2003) were raised in a close-knit family. Growing up, Michael was greatly influenced by his parents’ example to become an actor. Little wonder he went on to study Film at New York University; after graduating from high school in 2016. He also interned in a development and production role at Blumhouse Productions in Los Angeles. 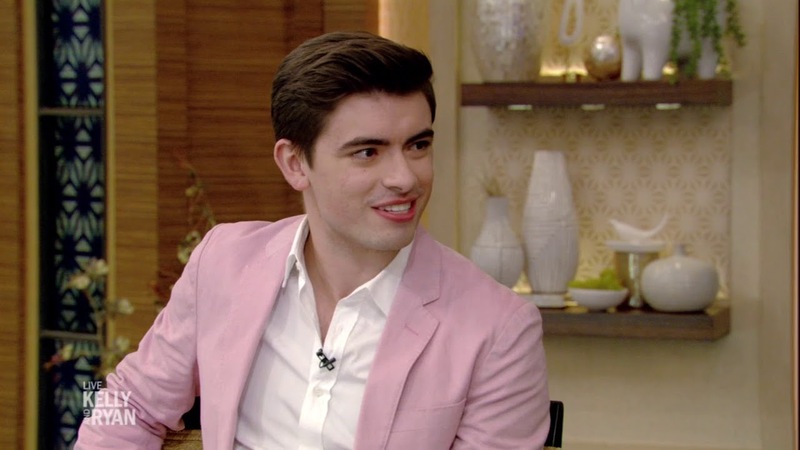 He became a regular face in his mother’s pro-LGBT show, Live with Kelly, from 2008 to 2013. And he joined his father, Mark, and the rest of his siblings in support of Kelly when she received her Hollywood Walk of Fame star in 2015. Although Michael Consuelos is known for his work on American teen drama television series, Riverdale, his first appearance dates back four years earlier in the 2012 movie The Bensonhurst Spelling Bee. A year later, he appeared in the 2013 American situation comedy series, The Goldbergs. In August of 2018, the Television Critics Association Summer Press Tour announced that Michael will man the role of the teen version of his dad’s character, Hiram Lodge, in a flashback episode of the CW television series, Riverdale. Fans called it a perfect match, seeing that Michael is considered a carbon copy of his dad, Mark Consuelos. When Kelly Ripa and Mark Consuelos met in 1995, there was sudden chemistry between them. They met on the set of the ABC soap opera, All My Children. While Kelly is known to be of American origins, Mark is a rich mix of Mexico, Italy, and American. He spent his childhood in Spain, Italy, Lebanon, and the US. About a year after meeting Kelly, the two eloped to Las Vegas. The circumstances surrounding that decision isn’t so clear. However, their union has produced three children so far, including Michael Consuelos, born in 1997. Three years later, the couple welcomed their second child, a girl they christened Lola Grace. And two years after that, their last child, Joaquin Antonio was born. The Hollywood couple raised their three kids in Crosby Street, a neighborhood in SoHo, Manhattan. But in 2015, they put up the house for sale for a whopping $20 million. That year, the family of five moved to a townhouse they had bought for $27 million in 2013. The house is situated on East 76th Street in the same neighborhood and belonged to Italian fashion designer, Luca Orlandi and his Nigerian wife, Oluchi Onweagba. It was the second most expensive house sale made in New York City that year. Since then, the couple has watched their once-young children grow into responsible adults. Much of Michael’s earnings have come from his short but successful acting career. His appearances on various films and talk shows like, Live! With Kelly has translated into handsome paychecks for the young actor. And, with his youthful face onset another season of Riverdale, the dollars are set to keep rolling in for Michael. As of 2018, his net worth stands at a whopping $2 million. Too much for such a young chap? No, Michael’s hard work is only paying off. Besides, his parents are to be thanked for setting him on this path early. His father’s net worth is estimated to be around $40 million. He appeared in the 2006 romance movie, Wedding Daze which grossed over $11 million worldwide in the box office. Plus, Mark’s appearance on movies and TV series like Cop Out, Alpha House, and Queen of the South has upped his earnings in no small way. His super mum, on the other hand, has an estimated net worth of over $120 million. With an annual salary of $22 million, one wouldn’t find it hard to believe she’s worth more than that. Kelly Ripa is considered one of the highest paid actresses in Hollywood today. Thanks to appearances on TV series like All My Children, Hope and Faith, Dance Party USA, and of course, Live! With Kelly. Although Michael Consuelos is still growing, there are telltale signs about how much of a handsomeness is still locked up within. At the moment, he is of average build and stands at a handsome height of 5 feet 7 inches (1.75 meters). He has deep brown eyes and wears black hair. Details about his Chest-Waist-Biceps measurements, dress, and shoe sizes are not yet known. His parent’s popularity with the LGBT community has raised speculations that their first son, Michael, might be gay after all. Besides, his supposed single status now gives fuel to these speculations. However, there are no solid grounds to prove Michael Consuelos as gay. No valid media release has cleared the air on this issue, and most importantly of all, Michael hasn’t come out plain on this. The young chap seems to be pursuing his career full throttle, and is enjoying his youthfulness; trying not to get wound up in some media wildfire.